Each edition of the five-part Art on Film/Film on Art anthology explores a single theme in the creation of art using the medium of film. 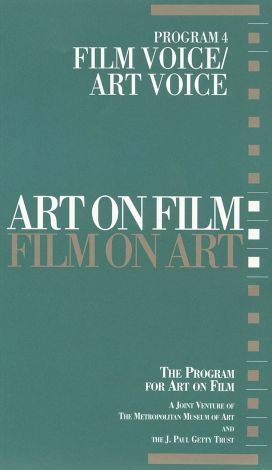 Each volume includes three short productions commissioned by the Program for Art on Film as well as insightful commentary and conversations from film experts and expert filmmakers. Program 4 -- Film Voice/Art Voice seeks to answer the question, "What constitutes the 'voice' of a film?" Also explored are questions about the types of voices -- and how many -- are conducive to the successful interpretation of a work of art through film. These issues are explored in the productions, which include De Artificiali Perspectiva or Anamorphosis by Brothers Quay and Roger Cardinal; Architecture of Transcendence by Richard Greenberg and Steven Murray; and Painted Earth: The Art of the Mimbres Indians by Anita Thacher and J.J. Brody.